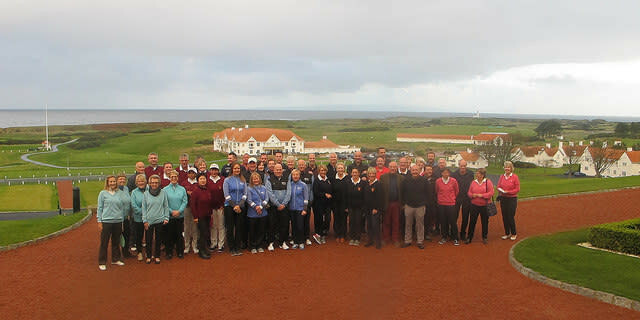 The 2018 National Golf Club Challenge (NGCC) concluded on the spectacular Ayrshire coastline for its National Final that was held on the 21st and 22nd of October at the legendary Ailsa Course, Turnberry. The men’s team from Hessle Golf Club won through to become the 2018 Men’s National Golf Club Challenge National Champions, with Brickendon Grange Golf Club winning the title of 2018 Ladies National Golf Club Challenge Champions. Massive names in the Golf Industry got behind the final; Prize donations from the likes of Motocaddy, Titleist and Stewart Golf meant that there was plenty for finalists to play for over the two days as well as the opportunity for the winning Golf Club to take back to their club the converted ‘Lee Westwood Cup’ kindly sponsored by Wedgwood. The National Golf Club Challenge finalist’s whole heartedly entered into the spirit of The National Golf Club Challenge; all applied themselves magnificently, playing in the spirit of the ninth running of the National Final to make the final a memorable occasion for all in attendance. The National Golf Club Challenge national final was attended by sixty golfers from around the UK; Each golf club was represented by five golfers resulting in six golf clubs competing in the men’s section and six golf clubs competing in the ladies section. Each Golf Club qualified out of thousands of golfers who participated throughout the UK at their own golf club’s 2018 National Golf Club Challenge qualifier event. Each event acting as a fundraiser for On Course Foundation. Also in attendance at the NGCC National Final were four On Course Foundation ambassadors – who are the direct beneficiary of the fundraising that The National Golf Club Challenge carries out. They played some impressive golf and spoke at the two evening dinners about the inspiring work On Course Foundation charity undertakes to enable injured and sick service personnel to build confidence and self-belief through golf skills and employment opportunities. 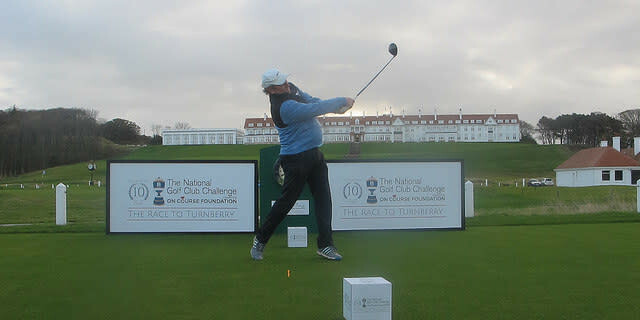 Stacey Jeffries, NGCC Event Director commented “Our national final at Trump Turnberry is a spectacular finale to The National Golf Club Challenge each year, especially as The Ailsa Course has to be one of the finest courses in world golf”. Stacey also commented that “We were deeply honoured and humbled to have had On Course Foundation ambassadors grace the final this year; their attendance reminded us all just how brave our military personal really are and focused our minds that we really must do all we can to continue to help our injured service personnel ”. Event Patron, Sam Torrance OBE commented “A massive thank you to all that have supported this year. We are indebted for your continued support. Together we continue to make The National Golf Club Challenge a massive success which in turn enables the vital work of On Course Foundation to continue. We now look forward to the 2019 National Golf Club Challenge as we celebrate our 10 year event anniversary. Our Event Patron, Lee Westwood OBE commented “Huge congratulations to the guys from Hessle Golf Club and to the ladies from Brickendon Grange Golf Club on becoming our ninth National Champions but also a huge thank you to everybody who has supported The National Golf Club Challenge throughout the year. Your support has made a massive difference to the lives of our wounded servicemen and women”. Lee went onto say “2019 will be The National Golf Club Challenge’s 10 year anniversary….Stacey will be running the main inter Golf Club competition, the popular online auction and a very special National Golf Club Challenge Celebrity Golf Day to celebrate a decade of golf coming together in support of our wounded service personnel. I would urge everybody to unite with us to help us make our 10th anniversary a special year in honour our wounded service heroes”. Golf Clubs throughout the UK are invited to take part in the 2019 National Golf Club Challenge, once again supporting On Course Foundation. Participating golf clubs can fundraise on the day of their 2019 event, throughout the event week, or even all year long. This makes it easy for every golf club in the UK to take part by simply nominating an existing event in their 2019 calendar as their Challenge qualifier. The National Golf Club Challenge 10 Year Anniversary Celebrity Golf Day will take place in June 2019.